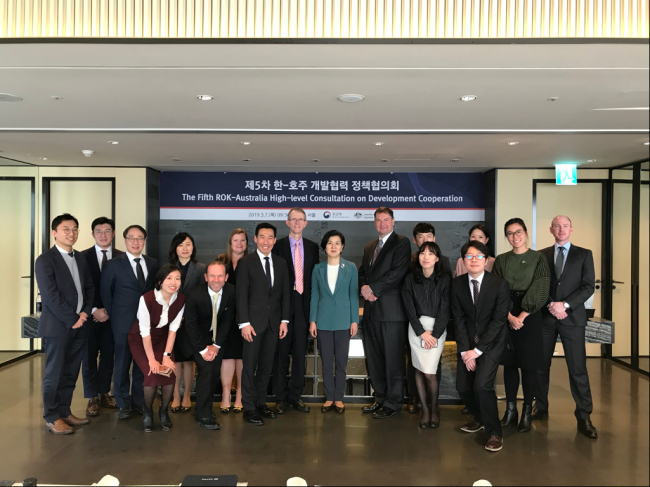 Officials from South Korea and Australia met in Seoul on March 7 to discuss ways to foster bilateral development cooperation and support the stable development of Southeast Asia and the Asia-Pacific region. A key topic at the meeting, called the fifth high-level consultations on development cooperation, was potential collaboration on infrastructure facility projects in Southeast Asia. The discussion was a follow-up to an agreement reached at the bilateral summit in November on the occasion of the APEC summit to seek synergy between the Korean government’s New Southern Policy and the Australian government’s Indo-Pacific strategy. The two sides also exchanged views on other matters of concern, including ways to implement the UN’s sustainable development goals, implement humanitarian assistance policies and invigorate partnerships in the private sector and civil society. The head delegate for the Korean side was Oh Hyun-joo, director-general for development cooperation at the Korean Ministry of Foreign Affairs. For the Australian side, the head delegates were Graham Fletcher, first assistant secretary of the North Asia division of the Australian Department of Foreign Affairs and Trade, and Chris Tinning, first assistant secretary of the department’s multilateral development and finance division.